You are currently browsing the tag archive for the ‘pavers’ tag. 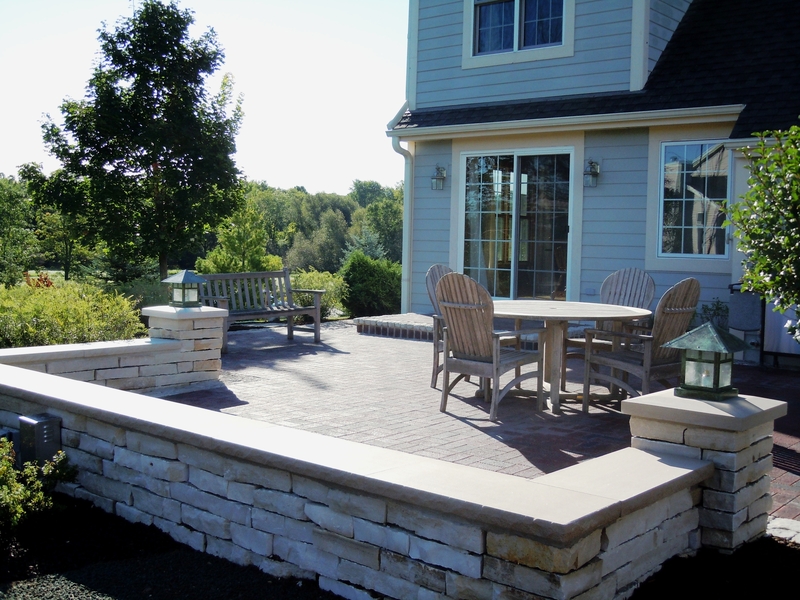 Are you tired of sitting out on the same old patio that you’ve had for years? Is it too small, dingy, uninteresting, or impractical? 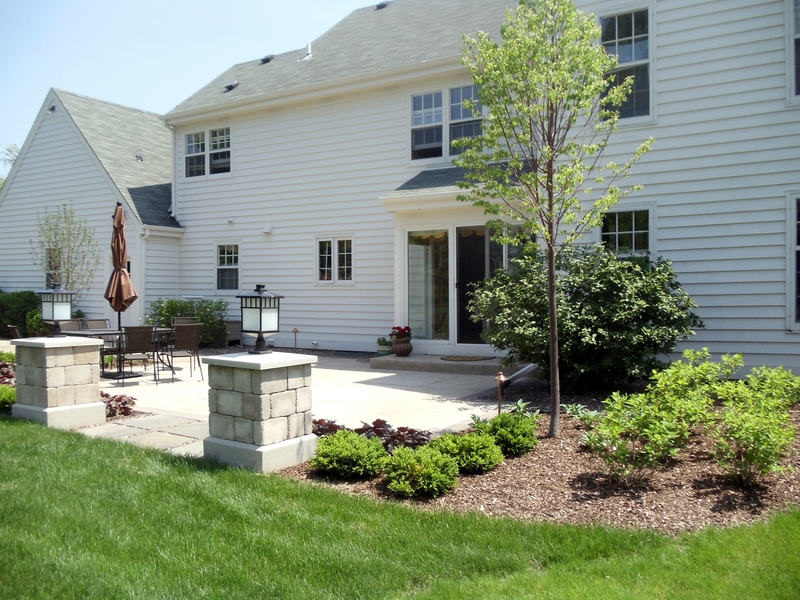 Utilize one or more of these patio renewal tips and bring it Back To Life!! Are the pavers, concrete or stone looking dirty, uneven or falling apart? Pressure wash to remove dirt and stains, repair cracks in concrete, sweep silica sand in the joints or mortar joints and seal the pavers to give you patio a “new look”. For uneven pavers or stone, lift and re-level the base with crushed gravel or sand and re-lay. Replace broken or chipped pavers. Is the patio area too small or uninteresting? 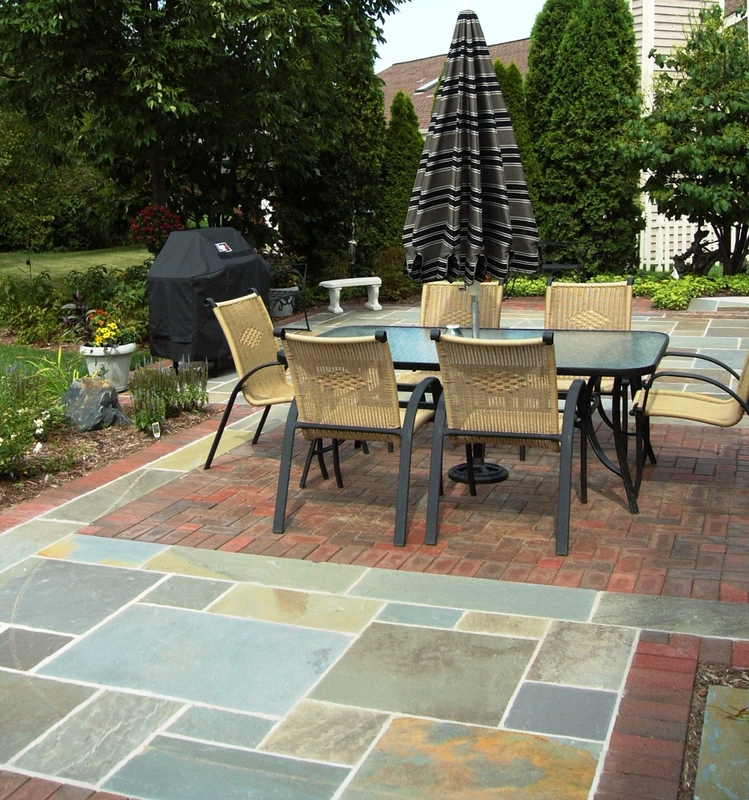 of your existing patio or a different complimentary material. 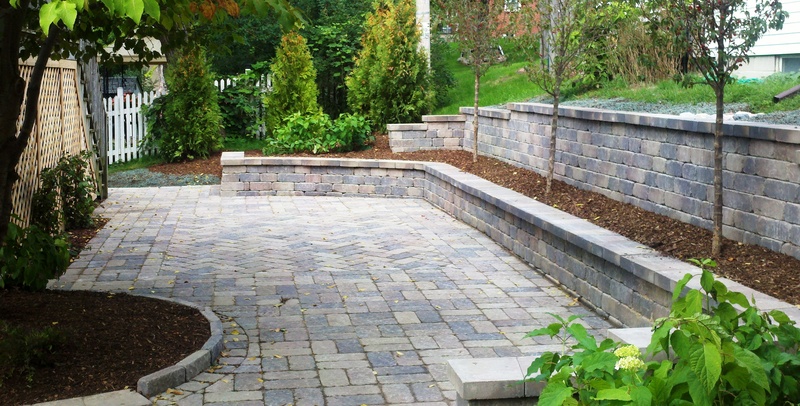 Edge the patio or add a border around the patio with brick, bluestone, or cobbles. Inset a different material inside your patio, like a brick “blanket” inside concrete. Add a pergola to create the feel of an indoor room and help shade the area. Add planting beds around the patio to create screening, giving it a sense of privacy. Use pleasant smelling plants, a tree with a nice canopy for shade, or edible plants near outdoor kitchen areas. Install outdoor lighting to light up plantings and sitting areas, extending patio use to the evening hours. Is the patio impractical? Make it more functional! Add furniture: chairs with comfy pillows, tables with umbrellas and rugs to create a living space. If your patio is big enough, establish more than one conversational area. Create an outdoor kitchen area. This could be for a free-standing grill or a built in grill with counter tops. Add a fire pit, gas or natural, permanent or free standing, extending the use of the patio during cooler days. 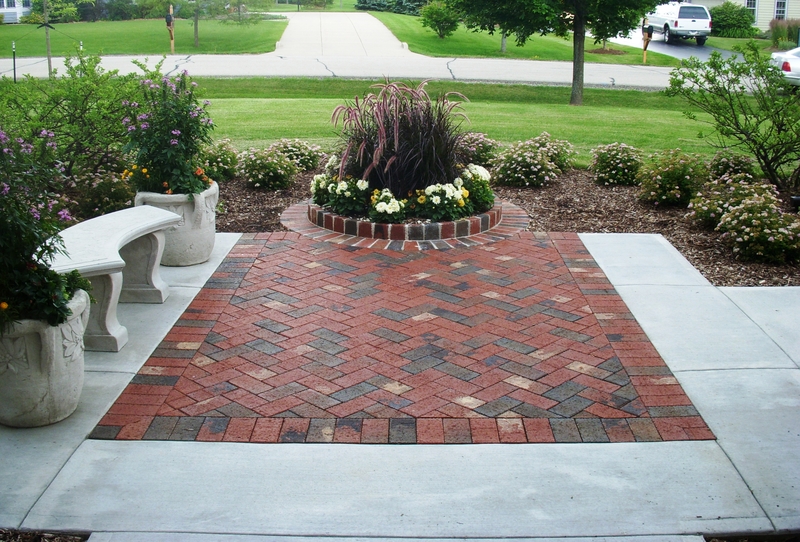 To create a more exciting patio at this front entry, we inset a brick “blanket” inside the concrete. A brick trimmed planter establishes an elegant focal point. 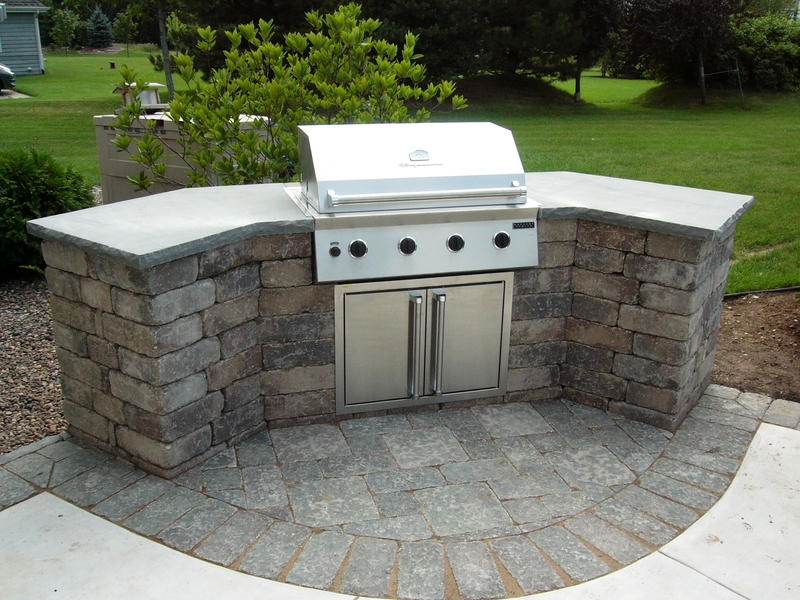 Make your patio more functional by adding an outdoor kitchen area like the one we constructed here with concrete wall stone and bluestone countertops. 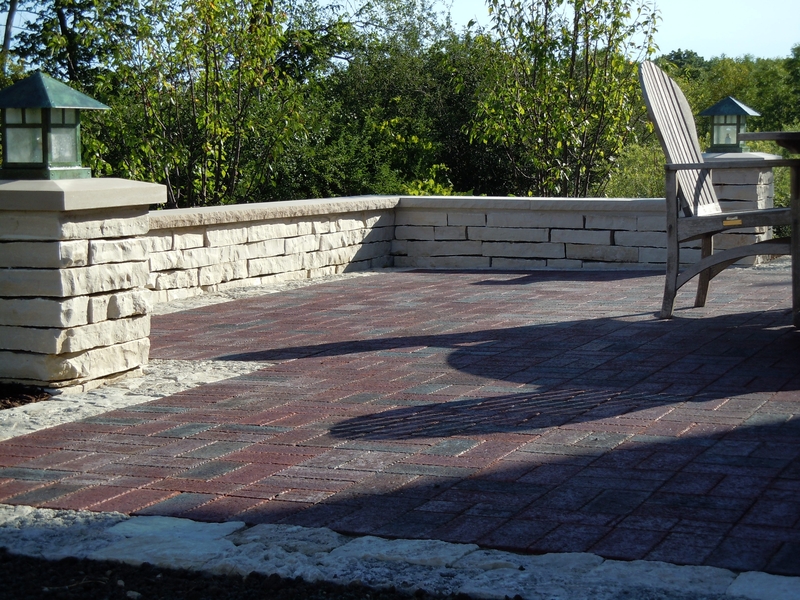 Matching concrete pavers are used for a landing area and a border around the concrete patio. 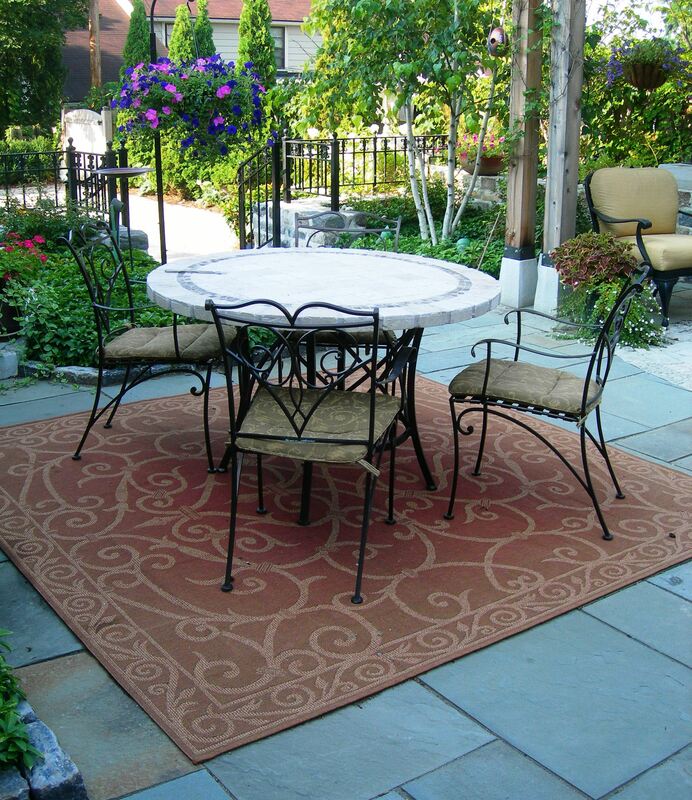 In this Whitefish Bay back yard, we created several living areas including this eating area furnished with a table, comfy chairs and an outdoor rug.